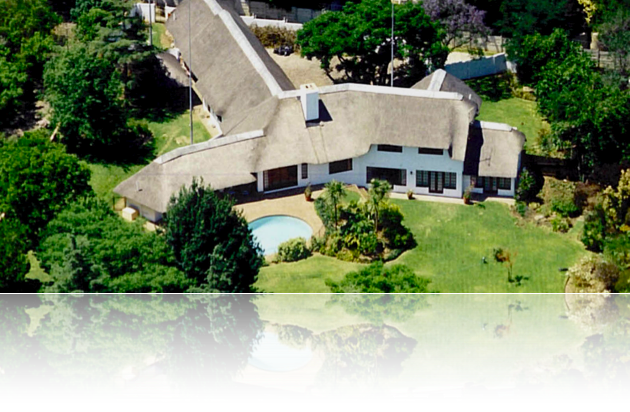 Thatches of Bryanston is set in a quiet, secluded garden environment in the northern suburbs of Johannesburg in South Africa, providing a degree of comfort associated with major luxury hotels. The prevailing climate is one of the most ideal in Africa, if not the world. Privacy and stringent security assure a high degree of discretion in all aspects of the traveler's sojourn. A small, intimate and exclusive family managed establishment caring for the needs of the more discerning traveler. An alternative form of accommodation without the formality of the larger hotels but with the luxuries and services to which the seasoned traveller is accustomed. Established in the heart of the business centre of South Africa; major international and national corporate offices. Rivonia, Rosebank and Sandton business areas are within minutes drive, whilst Midrand and Pretoria are accessed within 15 to 30 minutes. The sun filled living room opens onto beautifully landscaped gardens and swimming pool. Breakfast is served in the thatched recreation area adjacent to the pool, or privately in the suite. For those special gastronomic delights, dinner is served in the comfortable dining room or privately suite. All suites include individual entrance, dressing room and en-suite bathroom with shower. Satellite television ensures effective communication and full office services are available for the business traveller.